For years I have tried at TruthUnity to "build community" online—it's not easy and I've never felt successful at doing it. I want to share with you a resource—not on TruthUnity—but one that just may in time be the most successful online community we have in Unity—the Unity Urban Ministerial School. It may seem strange that TruthUnity is promoting another resource. But I am convinced that institutional pluralism is the future of Unity and "being organic" is one of our most promising guiding values. If you're looking for a community of love and compassion, read on. Next week begins what is known as "L&O"—Licensing an Ordination—at the Unity Urban Ministerial School (UUMS) offices in Detroit. L&O can be a stressful time for students, but I have been told that UUMS students affectionately refer to it as "Love and Order." It's important to know why students say that. You see community develops where love and order is present. The Unity Urban Ministerial School teaches with heart and compassion and less from the intellect. But it's not just love that is taught at UUMS; it is also the embodiment of love—which we locate in the body center—where order resides. When love and order are the guiding Principle we will see community form. That is why Unity Urban Ministerial School students "come to UUMS for the education and stay for the community." Over the next several months I am focused on developing a new website for the Unity Urban Ministerial School—built on Drupal 8—Drupal being the technology that runs Unity World Headquarters, Unity Worldwide Ministries, the many OnReach church websites and TruthUnity. My hope is that we may finally see a successful online community. What is different this time is that the community is already there—vibrant, strong, loyal and loving—inspired by Dr. Ruth Mosley and carried forward by Dr. Catherine Thomas. I'll build the site, will you join the community? First, click on the above picture to download a high-resolution copy. Take it to the photo desk at Walgreens or CVS and print it out as a 4x6" photograph. Place it on your bathroom mirror. Each day know that more than one hundred alumni, more than 70 students, more than 20 faculty and a dedicated staff and board are focused on bringing the heart and compassion of community to the world—what we proclaim as "urban ministry." Join with us each day in holding that in consciousness. Second, join our Unity Urban Ministerial School mailing list if you're not already on it. You will know if you are on it if you have received another email at this same time from UUMS. To join the mailing list, go to the Unity Urban Ministerial School website. 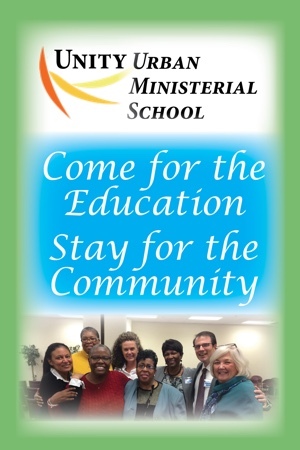 L&O at Unity Urban Ministerial School will conclude with graduation and ordination on May 5th. If you are unable to attend, know that we will live stream the entire proceedings. But if you join the UUMS mailing list you will get an email next week that gives a link to where you can click to watch it. But really, we want you to be with us in Detroit.